KiwiSDR is a SDR (software defined radio) receiver for the entire frequency range from 10 kHz up to 30 MHz. The HF unit is installed on a Beagle Bone single board computer (something like the Raspbery Pi). The distinct feature of the KiwiSDR is the built-in web interface (OpenWebRX). No hassle with USB drivers, no need for extensive software installation, you just use your existing web browser (Chrome or Firefox). Just connect the SDR via Ethernet to your local network, hook up an antenna and power supply and fire up your browser. 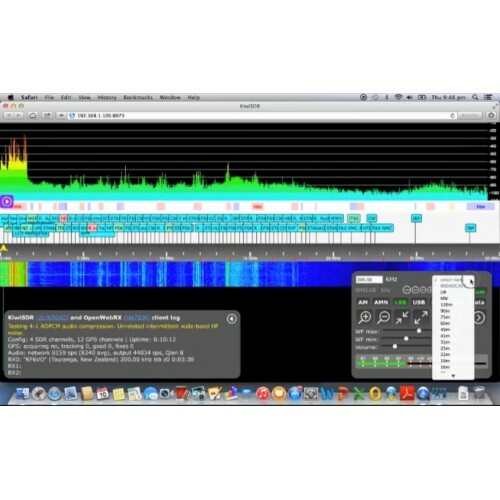 This makes the KiwiSDR very portable as it can be used with Windows, MacOS or Linux. The included GPS antenna is used for frequency calibration and time synchronisation. Up to four users can listen to any frequency in the entire spectrum range from 10 kHz to 30 MHz at the same time. The tuning is done by clicking in the waterfall display, or by entering the frequency directly into the user panel. When the local router is properly configured you can connect to your KiwiSDR from any place in the world. There are already many KiwiSDRs accessible at any time, see link below. 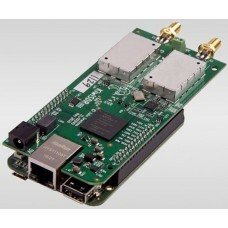 The software of the microcontroller and the hardware design are open source and freely available on kiwisdr.com/KiwiSDR. The receiver is supplied at complete kit, consisting of both boards (KiwiSDR, Beagle Bone Green), a ready to use MicroSD memory card with the software, parts for the case and a GPS antenna. All you need for instant operation is a 5V/1A power supply (2.1mm coaxial DC Connector) and an antenna. Size: 124 x 83 34 mm. Click here for a list of several dozen KiwiSDR around the world.